Our guide was punctual and spoke good English. He picked us up at 6:00 p.m. in a car at our hotel and we were driven to the Jin Mao tower. The size of the crowds everywhere in Shanghai boggle the mind. Throngs of people lined up at the elevator to go to the 88th floor, which offers spectacular views of the city, at least of the surrounding area because of the smog. We were then driven to the dock from where the Huangpo river cruises depart. Again, hordes of people lining up for a cruise. Our guide went to buy tickets for the 7:45 p.m. cruise and then came back to tell us that all the tickets were sold out. He got into a fight with the ticket agents who said they would never sell him tickets again. We would have to wait for the next cruise at 9:00 p.m. He then suggested we have a continental dinner at the hotel nearby (our tickets didn't include dinner). We replied that weren't interested in a continental dinner but wanted Shanghainese food, whereupon he took us to a Chinese food court close by and returned at 8:30 p.m.
Well, the boat was very crowded and had no seating! When I asked the guide about this, he said seating wouldn't enable so many customers aboard. There were plenty of other cruise boats around us with nice seating easily visible. Great tour! Great guide. This was a lovely way to see The Bund while in Shanghai. A very enjoyable tour, our guide was amazing and spoke very good english. The tour included visits to Jin Mao Tower, this was a great view of Shanghai and a must see! 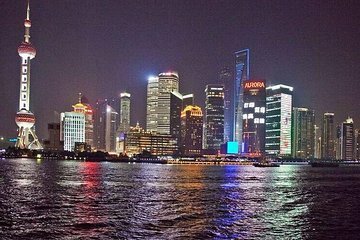 The Bund is also a great view looking back on Shanghai city for you to get the perfect pictures! and the river cruise was amazing, be sure to pay the extra 10 to get to the VIP area, well worth it to get out of the hustle and bustle of tourists.